University educated musician and experienced teacher available for all ages, skill levels, genres and aspirations. Whatever you want to do with music, I can help you achieve it! 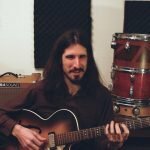 I can teach guitar and bass up to an advanced level, including technique, theory, instrument care and maintenance, composition, ear training and of course learning all your favourite cover songs. Lessons that are fun and lay the foundation for creativity and a love of music, but can also be challenging and promote musicianship and mastery.